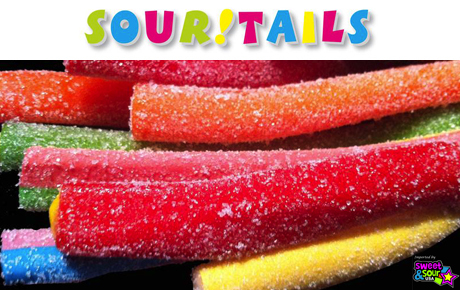 Hide deals from seller "Sourtails"
Hide deals from category "Candy Stores"
Limit 1 per person and 1 per transaction. Valid on 4 Sourtails candies. Candies measure about 3/4-inch in diameter and 20 inches long each; may break into smaller pieces during shipping. Select 4 candies from 9 available flavors. Most orders ship within 7 business days. Shipping fee of $5 not included and must be paid at checkout. Promotional value expires 60 after purchase. Make the sweet a little sweeter with 50% off four Sourtails candy ropes, available nationwide ($20 value). With nine sour flavors including blue raspberry, cherry, apple, watermelon, strawberry, lemon, rainbow, peach and grape, Sourtails will give you a new experience of your favorite fruits. These 20-inch candies have long been a staple of European confectioners and have finally made their way to the United States. This delicious candy has the perfect blend of sweetness and tartness, giving you a mouthwatering snacking experience that will awaken your senses. The sweet, fruity candy is coated with a special sour powder that allows you to savor the complex and delightful flavors. This candy is perfect for children and adults alike. Online retailer that offers delicious sweet-and-sour European candy in a variety of flavors.